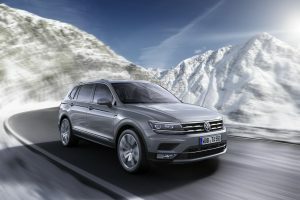 VW launches another SUV at Geneva | Hoot! It may look like a Tiguan which.. err.. it is. Except it’s a bit longer, has more interior space and an optional extra row of seats and has an extra name to go with it: The Tiguan Allspace. Similar to the USA’s Atlas model, the Tiguan Allspace has a newly designed radiator grille with its chrome trim strips and a newly designed roof section, with structural lines extending the length of the roof. The Allspace comes with a range of engines, some of which come complete with the 4Motion four-wheel drive system. Prices in Germany start at about €30,000, which is about £26,000 at today’s exchange rates. Order books open in May. This entry was posted in Volkswagen and tagged 4Motion, Allspace, Atlas, Tiguan, Volkswagen. Bookmark the permalink.